Since I am trying to convince myself that this blog is not entirely shaped by my own biases, I intend to keep within the broad confines of electoral commentary and, ultimately, prediction. Since it is in my best interests to have accurate predictions, this should somewhat limit my own ideological inclinations and look at cold hard facts. I do data, and I do interpretation, but not opinion. The line between interpretation and opinion can be a thin one, but in my definitions interpretation aims to explain known facts (e.g. the reluctance of the major parties to change leaders) while opinion is about personal judgement and extends beyond the bounds of provable suppositions. Fundamentally, opinion is untestable, interpretation can be born out or refuted by additional data. As a result, I tend not to focus on policies and promises – which are hard to factor into any predictions mathematically – and use polling as a substitute in their stead. I am not entirely sure why we have opinion pieces in newspapers, unless we have reached a point where we need other people to make up our minds for us, but I will leave policy discussions for those writers. That said, my initial plan for this week was inspired, or rather brought forward, by Labor's proposed media reforms. 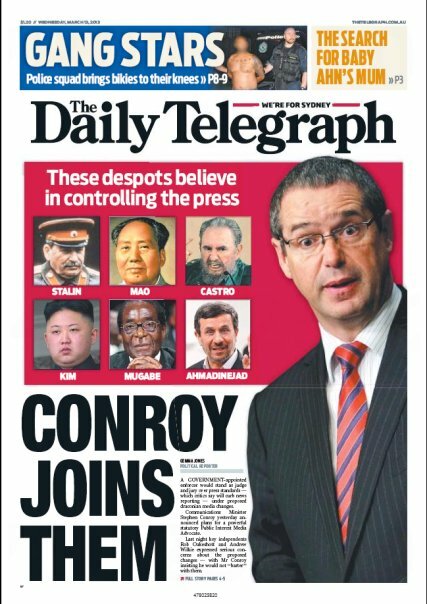 I don't intend to go on about Conroy's handling of the bills or debate the merits of the policy. I want to talk about the role the Media has in elections, because obviously the media is instrumental in influencing the voting public. This is why the Coalition was so opposed to Labor's attempts to strengthen regulations on right-wing newspapers, and why Labor has always opposed Coalition funding cuts to the ABC. Charles Baudelaire famously said that "the greatest trick the devil ever pulled was convincing the world he doesn't exist." The same is true of the power of advertising. Many people would swear that they are not swayed by advertising, and it is precisely these people who are swayed most by it. They are convinced that, while others are sucked into brand loyalty, they are immune because of their cunning intellect and penetrating alertness. “I drink Coke and Pepsi,” they explain. “I shop at Coles and Woolworths. I compare three or four mobile phone plans, or insurance plans, or mortgages before I commit.” What they fail to grasp is that they, and indeed all of us to some extent, are ensnared in false dichotomies, or trichotomies, or any-other-chotomies. We choose freely between a narrow field of well-advertised options, but ignore others simply because we don't know they exist or they don't come to mind when contemplating our choices. The same is true in politics. Last federal election, when there was a strong sentiment of being fed up with both Labor and the Coalition, over 80% of the Lower House primary vote still went their way. Ignoring the Nationals (but still including the Country Liberals and Liberal National Party of Queensland), the Labor-Liberal dichotomy still garnered over three quarters of the vote. In the Upper House, where minor parties are more easily elected, and therefore more worth 'risking your vote' for, this may be less extreme, but the AEC doesn't do nation-wide tallies of Senate first preferences. (Because senate ballots are organised by candidate, not by party, different states are not directly comparable.) On the other hand below-the-line voting is regularly less than 5% of the total vote in the Senate, which indicates that people still vote for parties, not candidates, and the major parties will naturally dominate that contest. Obviously it is in the major parties' interests to keep the media framing their news stories in a Labor-versus-Liberal paradigm, since this results in more of the audience (be they readers, viewers or listeners) supporting or – equally valuably – opposing one party and voting between the two. Some people do this because they don't really follow or care about politics, and just want to get out of the voting booth as quickly as possible to enjoy the rest of their Saturday. Others consider it a waste of their vote if it doesn't go to a candidate with a high chance of winning – although I always wonder how valuable this 'unwasted' vote is if you don't get to exercise the full choice it offers. It also highlights a limited understanding of preferential voting. It has often been claimed that a free press is essential for democracy. The line was certainly parroted by many newspaper representatives recently in place of actually answering the questions put to them. The media, as a result, is often termed the fourth branch of government; the Executive branch (Prime Minister and Cabinet) rule and conduct the affairs of state, the Legislative branch (Upper and Lower Houses) make the laws, the Judiciary (Courts) uphold them and the Press holds everyone to account. The separation of powers (i.e. the independence of the Judiciary from the Executive and Legislative) is a fundamental check against corruption and is enforced by most national constitutions. For those who insist that the media is a forth branch, independence from the government and courts is of fundamental importance but not necessarily recognised in law. Conversely, most people would probably agree, there need to be some safeguards on accuracy and integrity or else the media fails in its duty to inform the public. Exactly how strict these safeguards should be, whether they should be embedded in law and who should monitor them is essentially at the centre of the proposed media reforms. I am not going to argue on this point one way or the other, because I refuse to lower the tone of this blog to that of an opinion column. But if the media has a role in ensuring the survival of democracy, it follows that it must also have the power to influence our votes. Just as journalists can provide the facts that allow us to make informed decisions when we cast our ballots, they can weave a story that can channel our emotions and lead us to cast an uninformed, or more accurately, a sentimental vote independent of any objective facts. To return to the world of advertising, it is a well known maxim that “people buy based on emotion then justify after the fact with logic.” Once again, this is no less true in politics. Look! Over There! A Distraction! In the lead up to the vote on the media laws, one might have expected the bill(s) to be withdrawn and the PM to point into the depths of her backbench and yell such a line. Perhaps what followed was a distraction planned ahead of time. Probably not. Either way, everyone was distracted. I refer, of course, to the leadership non-challenge. The bit where Julia Gillard went from being PM to being PM. The bit where Kevin Rudd didn't do anything. The bit where nothing changed. “Is this the end for Labor?” the paraphrased headlines read, to which the answer is 'no'. The events of Thursday last week may cause a small hiccough in the polls, but in the long run Labor is either still in with a chance, or was ruined a long time ago. Only time will tell if their long-standing position in the polls can be reversed or not, but last Thursdays events are unlikely to aid or to hinder in the long run. Naturally the topic of this post was going to shift to focus on the leadership not-spill, but I have begun by discussing the media because the two are very closely linked. In fact, the leadership problems for Labor are partly – though certainly not entirely – the result of a self-centred media. Much of the modern media considers themselves gatekeepers of knowledge and protectors of democracy. This is almost entirely confined to traditional media – radio, television and especially print media. I briefly referred to The Narrative in a previous post, which is something that others have discussed in far deeper detail. To paraphrase these people, The Narrative is the belief that there can only be one over-arching news story at a time, otherwise we – the poor untrained public – will be confused. At present The Narrative seems to be that the Gillard government cannot do anything right. If they launch an initiative they are spending money they don't have, and if they do nothing then they are failing to meet the needs of Australians. This is why there is constant reference to how bad our economy and job markets are doing, even though we have a AAA credit rating, low inflation, low unemployment, low interest rates and our net foreign debt is insignificant by global standards. I began my papal election post by discussing the media's unfounded fear of this country becoming irrelevant. There is, however, one greater fear – and one that is far more solid in its foundation – that the media itself may become irrelevant. The rise of the Internet, social media and blogs (like this one (but with wider readerships)) are often seen as inferior news sources that undermine the bastion of purity that is true journalism. If alternative sources are replacing the traditional media, it is not because of some deliberate plot, or due to illusions of grandeur among the 'technology-savvy' (and by the 'technology-savvy', I mean anyone capable of using a search engine, also known as 'witchcraft' by some news media editors). It is because the traditional sources are no longer considered adequate (if, indeed, they ever were). We want different opinions, varied interpretations and the ability to make up our own mind. If The Narrative was ever a valid approach to reporting it should have died out with Bakelite appliances and 1950s housewives. But most of all, we want substance. I should specify, my aim for unbiased reporting extends only to party politics. 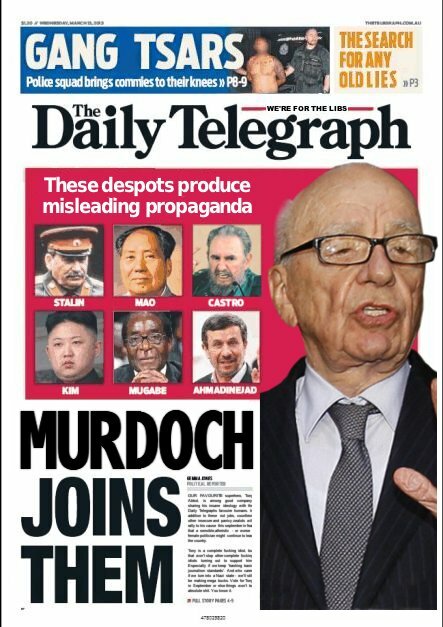 I reserve the right to criticise Rupert Murdoch and the rest of his friends in this image. Often we hear complaints that modern politics is too focussed on personalities and perception, rather than policies (again, see the Daily Telegraph example for how the former is used to trump the substance of the latter). News sources echo this sentiment as much as the rest of us. But the solution is simple – the media needs to inject some standards into its political reporting. Major announcements on health, education and, most recently, an apology to victims of forced adoption have all been absent from news headlines, replaced by spats between politicians and internal division. The media is terrified of losing its monopoly on framing the political discussion, but fails to do anything to improve the level of reporting. In the year two-thousand-and-ten, the media woke up to a slap in the face. Kevin Rudd had been replaced as PM, and no-one had really seen it coming. Major news outlets determined not to be caught out again. When Julia Gillard's popularity dropped, they began to ask if there would be a return to Kevin Rudd. Leadership speculation was reported for months on end, although all they were really reporting was their own uncertainty. Yes, there was speculation. Mostly it was media speculation. Polls were commissioned asking who would be preferred as PM – Rudd or Gillard. Labor MPs began to ask if they had made a mistake. Some had never supported the change to Gillard in the first palce. Now there was more than speculation. There were “rumblings from within the Labor Party”. Alarmed, number-counters within the party checked and double-checked their figures. They tried to sure up support for their respective contenders. Rather than letting the past die, as would probably have happened naturally, the media accelerated the ALP towards a second vote between Rudd and Gillard. Certain of victory, Gillard promised if she lost she would not contest the leadership, and asked for an equal assurance from the doomed Rudd. Gillard won and Rudd vowed to let the whole issue die. 'Speculation' returned. 'Rumblings' were detected every now and again. Eventually another vote had to be held, or else the government would be hamstrung throughout the campaign by a constant focus on instability rather than policy – because the media will always report personality clashes and infighting over government projects and funding. That's why people watch sports, not accountants. The Colosseum is three or four times the size of a Greek amphitheatre; Roman gladiators were always more popular than Greek debates and political plays. Or obscure blogs on elections, for that matter. Rudd kept his promise not to challenge, and the media was outraged. They had been duped once by failing to suspect the challenge that put Gillard in power, now they had been duped again into expecting a challenge when there wasn't one. And because Rudd had made it clear he was not going to mount a challenge before the next election, much of their previous work was exposed for the empty supposition it was. Worse still, there was a risk they might have a stable government and have to report on boring old policy, not the brutal cut-and-thrust of backroom deals between faceless men. It was unthinkable – like a crime series written about the solving of crimes rather than the strain of the job on the main characters' families, or the sexual tension between two cops. These leadership challenges – or non-challenges – are not confined to the Labor Party or to federal politics. The changes in the federal Liberal Party leadership, from Nelson to Turnbull to Abbott might not be new news, and they were in opposition at the time, so it is often ignored when Coalition MPs point the finger at the Labor Party's instability. Since then the South Australian Premier Jay Weatherill forced his predecessor out of power, Lara Giddings replaced David Bartlett (although this was done amicably) and in the last month there has been new leadership in the governing Victorian Liberals, and in the Country Liberal Party in the Northern Territory. Interestingly there is a large push from outside the federal Liberal-National Coalition to bring back Malcolm Turnbull as leader, and Kevin Rudd consistently out-polls Julia Gillard. Understandably many people are confused by the persistence of these parties to persevere with their less popular leaders. In reality a change of leadership would actually do more harm than good for both parties. [...] during this term of Parliament there have been several poll-related stories suggesting Kevin Rudd would beat Opposition Leader Tony Abbott if he were returned as Labor leader. For much of the 43rd parliament polls have showed Mr Rudd is indeed more popular than Julia Gillard and Tony Abbott. However, because Labor trails the Coalition by a long way on the primary vote and on a two-party preferred basis, there isn't enough hard evidence to suggest Mr Rudd would certainly win an election. Professor McAllister says, "Relatively small numbers of people change their vote from election to election. So the net effect of a popular or unpopular leader is not as large as people think." It is also important to ensure personal preference is not confused with voting intention. For example Dr Kevin Bonham provides us with a table comparing Galaxy and ReachTEL polling. Both favour Rudd over Gillard, and diverge on the preferred Coalition leader between Abbott (ReachTEL) and Turnbull (Galaxy). Since Galaxy is a national figure, and ReachTEL is Western-Sydney specific, we'll focus on the Galaxy Results. Normally a quick news story will glance over this data and move on. However, if we break the polling down into ALP, Coalition and the rest, we see that ALP voter preferences for PM are, in descending order, Gillard, Rudd, Turnbull, Abbott. Coalition preferences run in exactly the opposite direction. The rest run Rudd, Turnbull, Gillard, Abbott. So the decision is more complicated than at first thought. A lot of the votes for Rudd over Gillard comes from Coalition supporters – who won't vote ALP regardless of who leads – and a fair chunk of Turnbull's support comes from staunch ALP voters – who won't vote Coalition. Changing leaders could arguably win over many of "the rest", although the left-lean in that sector (preferring Rudd to Turnbull and Gillard to Abbott) may represent some entrenched Greens voters who won't budge either. Another poll, dissected on Gordon Graham's blog, indicates that among Labor voters the perception is that things are as good or better under Gillard compared to Rudd's time in office (Better 42%, Worse 39%, Undecided 19%). As I mentioned earlier, a change of leadership is rarely more than a change of figurehead. While people do vote based on opinion and how likeable a Prime Minister is, they are equally swayed by how policies may effect them. The big, terrifying taxes and the revolutionary, life-changing programmes are almost always less drastic than initially portrayed, but they have far more emotional impact than the personality of the leader. A leadership change will, at best, provide a temporary blip in opinion polling and be thoroughly ironed out by election day – unless the change occurs shortly before an election, but this would mean leaping blindly into the vote and could result in a massive backlash (as with the 2010 Federal Election) or appear to indicate instability. The appearance of instability is an even bigger reason as to why the parties want to retain their current leaders. At the moment the claim that federal Labor is incompetent is being pushed by Coalition MPs. No surprises there. Part of that argument has been the persistent leadership problems for the Gillard government. This means that a change in ALP leadership will add fuel to the fire, and probably cost a lot more in the long run than it earns; there is no doubt the Coalition would capitalise enormously on such an event. Conversely a change of leadership in the Coalition would cost them the high-ground. The recent changes in Victoria and NT have already proved to be a significant thorn in the side of those pressing this argument for the opposition. For those who want a Rudd or Turnbull government, I can see only one option. To install Turnbull you must, counter-intuitively, get Labor elected this election and hope that the Coalition drops Tony Abbott after losing what should have been – based on current polling, at least – an easy win. Alternatively, to get Rudd back, you will have to get Tony Abbott elected as PM and give the Labor party the chance to pressure Gillard into resigning. A forced leadership spill won't work, since Rudd has tied himself to his pledge to run only if the position is vacant. However, in such a situation, I would expect the leadership to pass to Bill Shorten since very few people who served under Rudd enjoyed the experience.